I'm more and more thinking of these "reform math" people as sociopaths. What other description makes more sense? Some very good points, Laurie. As a professional mathematician I'll reinforce that, in terms of where mathematics goes in advanced studies, the number line is the principal model and should be the basis for numerical thinking. And, as you say it provides the epitome of clarity, conciseness an efficiency. The quotations you provide are appalling. Even though the models individually may have some merit it is obscured by these poorly articulated lessons. I see no reason anyone should prefer these other models although many of them could be peripherally used to supplement or illustrate the use of the number line in specific settings. But they are mere flesh to hang on the essential skeletal structure that things like the number line provide, giving solidity and superstructure to one's knowledge. "Position" is a number which says, in absolute terms, where you are on the line. In this conception each point has an a priori "address" that allows us to locate it absolutely as if in a well-organized filing system in which "units" are uniformly spaced "steps". "Displacement" is a number which tells one how to get from one point to another -- an instruction for relocating relative to your current location, if you will. If your current position is 3 and your displacement is 5 then your destination is 3+5=8 (another position). It is an interesting (and elementary) theorem that one arrives at the same destination starting at position 5 and "adding" displacement 3. Since displacement always uses a referent direction (positive), going in the other direction automatically represents negative numbers. Subtraction naturally fits in this schema. One way is through questions like "If I'm here then how do I get to there?" Normally we orient the line so that the "positive" direction is to the right, so 3 "steps" to the left may be denoted by a displacement of -3. A displacement of -3 from position 5 gives destination 5+(-3) = 2. We may use the shorthand 5-3 for this as well -- in fact, this is precisely the mathematical concept of "subtraction" as we use it in very advanced math, and the earlier students understand it the better. What I am arguing here is that there is no reason writing a-b as a+(-b) should be treated as overly "abstract" (in the derogatory sense of being too divorced from tangibles to be understood easily) -- it is a simple concept derived direction from everyday experience. It should be noted that position can be thought of as "displacement from 0". Thus, if you begin with a marked point called "0" and the concept of displacement, you can recover the concept of position (I'm not a primary grade teacher so don't know how this should be articulated for young 'uns but at some point it should become integrated into their concept of the number line. Thus "-3" is the "position" that you arrive at by a "displacement" of -3; that is, subtract 3 from 0 to get to -3, or 0-3 = -3. Students who have this particular precursor "down pat" have a huge advantage over others when it comes to elementary linear algebra and vector geometry. I've noticed students getting weaker and weaker in this course, which probably stems from failure to emphasize the number line in early education. In the terms I describe here this is probably inappropriate to teach to young children; I am using "adult" language. This is something that bothers me about the reform (I call it the "fuzzy") approach: they develop technical language for teachers and then appear to expect young children to learn this language. No. We can discuss "position" and "displacement" in these abstract terms but let us talk to children in ways that are natural for them. Here's an idea: an addition slide rule. 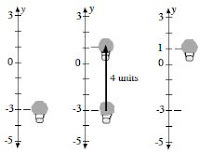 Mark a fixed reference "bar" and a sliding "bar" in the same uniform "number line scale". You add 3+5 by placing the 0 of the sliding bar over the 3 of the fixed bar and reading the number under the 5 on the sliding bar. Use the concepts of position and displacement (in appropriate language) to support understanding of the toy. If you've marked negative numbers, it also subtracts (even if you haven't, it is easy to devise a procedure, but I'd rather the whole number line is marked). Do it with two meter sticks to add (or subtract) numbers up to a total of 100. "...math reformers seem to think they have all the time in the world. To them, math isn’t about efficiency and correct answers; it’s about struggle, failing, striving and playing games... they’re motivated to not just prefer the inefficient models, but to actually eliminate efficient models, to mock them and to label them as counterproductive. Great article. It is so hard for me to get a handle on WHY someone would advocate for the types of convoluted questions that you cite above. What sort of ideologues are we dealing with? What can explain their behavior? Niki, given your experience (I've read about it), I'd love to hear your thoughts. I realize that anecdotal evidence isn't always the best explanation but somtimes experience, old age, and hard-gained wisdom is pretty good stuff to go on. What I'm about to say is something that I realized, after reading your question, that may be part of the answer to today's disaster in education. I learned that the New Age folks really did believe they had a huge advantage over the "ordinary" person because they saw themselves as extraordinarily intellectual and far more introspective and ethereal than most folks, especially those in America. Their goal was to bring all young learners into their world or "realm" of thinking with its nuances, abstractions, metacognitive expansions, and subsequent brilliant creativity. It was as though I was watching a Star Trek program where wonderful individuals were living in the clouds, far removed from the rabble on the earth below. I had been accepted, I think, because I was a math teacher and everyone knows that math teachers are really, really smart people (snort, snort). And, I even enjoyed writing which meant I was creative, right? The air of superiority has grown exponentially in schools of education as the Progressive/New Age philosophy has seeped into all crevices of the institution of education for the past 120 years (even before John Dewey "codified" the efforts). That air now holds the institution together as solidly as one would see with any well-built pyramid. Can it be brought down? I don't think so. Can it be replaced? Yes, stone by stone. What's particularly risible about this is that real numbers are *defined* as distinct points on the number line. The number line is not a heuristic device or a pedogogical tool. It is, in real theoretical mathematics, the *definitional basis* for real numbers and real number operations. To ignore it in favor of stupid story time models is disgusting. Solution: Draw 3 boxes (for the x term) on the left and 2 coins (for the constant term. 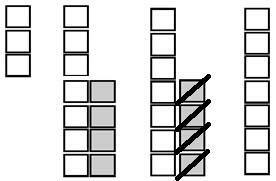 Do the same on the right except with 2 boxes and 5 coins. Once the drawing is completed cross out one box on each side until you cannot do so any more. Do the same for the coins. There is your solution! All the problems done in class worked in this manner. All terms were positive integers. All solutions were positive integers. Each difference between the x terms was 1 as to get 1 box in the end. In my work, I have seem many confused children. I am not sure I have ever seen one so confused and understandable so. Unfortunately, the student's confidence in his educational experience did not increase when I told him "Sorry, that method is not going to be useful here". This model is similar to some methods used by SPS though they use colored chips (like Connect 4 pieces) for positive and negative. On another note, elevators can technically go below ground. We do have basements after all. I actually feel the vertical number line works just as well as the horizontal one (perhaps minus silly unrealistic scenarios). It also is necessary when kids get to algebra and have the xy-plane. The construction of that typically begins with the number line. Whether we start with the y-axis (up and down) or the x-axis (left to right) is not really relevant. Most of the other models that I see are seriously flawed though and make it clear why our country is falling behind in math/science. What do people think about this idea, which involves using the number line to teach about adding and subtracting negative numbers? I show the negative side of the number line as the 'mirror image' of the right (positive) side. I encourage my tutees to actually use the phrase 'left side numbers', since 'negative' has a, well, negative connotation. Now, when we add a positive number -- no matter where we're starting from, no matter which side of zero we're on -- we're moving -- displacing -- to the right, to where the positive numbers get bigger. When we add a negative number, we're displacing to the left, to where the negative numbers get bigger (in magnitude). Subtraction is just the opposite. It's also necessary to teach that the word 'larger' in the context of negative and positive numbers usually means 'to the right of'. These are not ideas which can simply be told to a student with their comprehension immediately folowing. They've got to MEMORIZE (gasp!) the idea that 'negative numbers go off to the left, positive numbers go off to the right', and 'adding a positive number means going off to the right, adding a negative number means going off to the left' and 'subtracting a positive number means going off to the left; subtracting a negative number means going off to the right'. And they must memorize, know parrot-fashion, the phrase 'larger than usually means to the right of'. You've got to get them to know these ideas by heart, before you start working problems. All the things about balloons and debts and submarines, if necessary, must come LATER. In THIS case, we must move from the abstract and general to the concrete and particular. The problem with starting with particulars is that not all real-world problems can be mapped onto the number line. A debt is not necessarily the same as 'negative money' because you have a choice about whether or not to pay it -- if I owe someone $20 and I am paid $30, it's not at all necessarily true that I now have only $10.